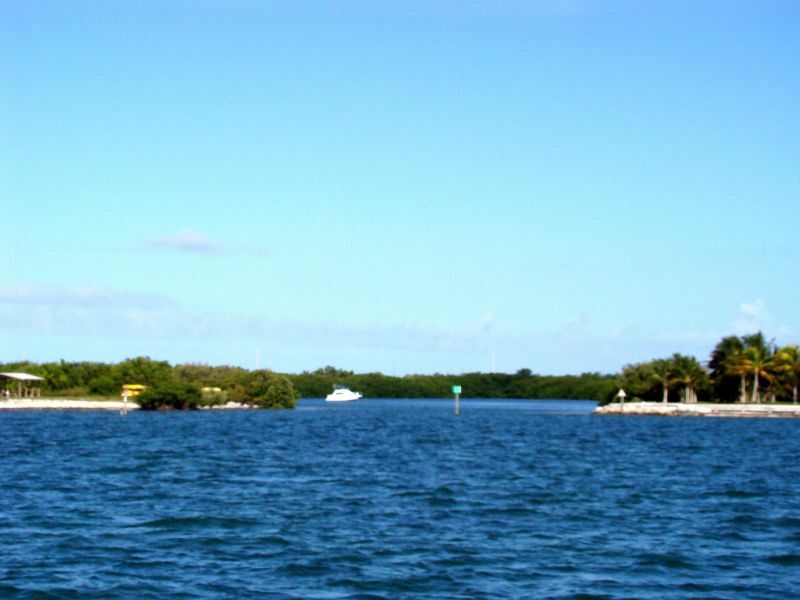 Boot Key Harbor has been known to anchor many a boat to the bottom, us included. We want to get out and spend time exploring the Keys and not just sit in the harbor. The weather has kept us either at the rare anchoring spot in the harbor or at one of the City moorings since we finished our repairs at our friends dock. So that's why we headed out before the wind and seas were forecast to lay down later today. 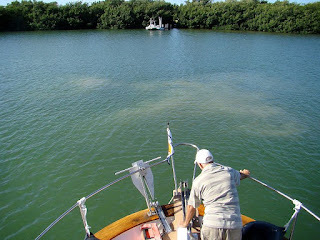 We winded our way through the entrance channel into the anchorage at Little Crawl Key at about 10 am. Coming into the entrance it takes a bit of a zig zag to miss the shoals extending out from the narrow entrance. But the clear water makes finding the deep water easy. As soon as we were inside the depths dropped off to 10 feet and the anchorage averages 6 to 10 feet throughout. We found another boat anchored in the center of the basin, but there is still plenty of room. The hook set immediately in 8 feet of water and the anchorage is absolutely fantastic (Lat 24.44.580N and Long 080.58.845W). 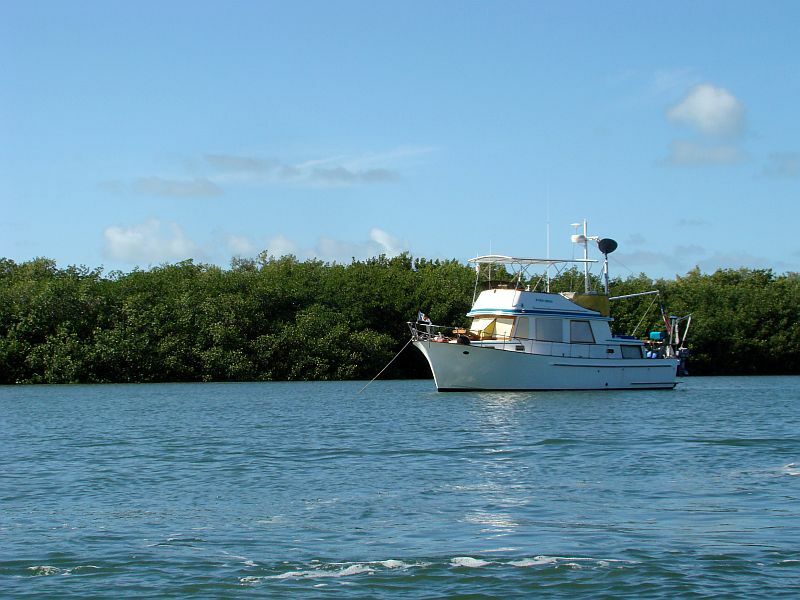 The high mangroves give good wind protection and the bar at the entrance breaks up any seas. We didn't see less than 5 feet 9 inches in the channel and the tides were less than a foot above low tide. A boat with more than a 5-foot draft would have to come in at high tide. With the anchor down we took a few minutes to just relax and take in the sights. 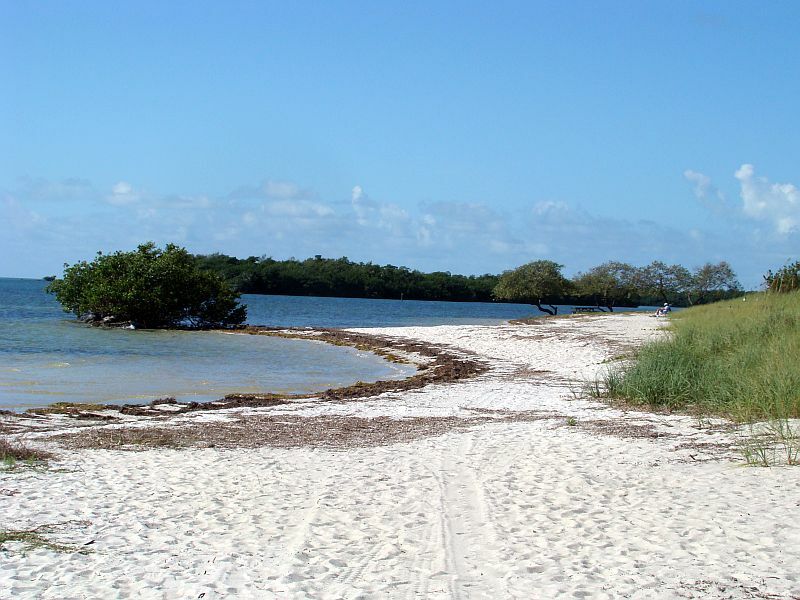 The basin has Valhalla Point Resort (now closed) on one side and Curry Hammock State Park on the other. We shared the anchorage with another unoccupied boat, a handful of kayakers and some Spotted Rays. 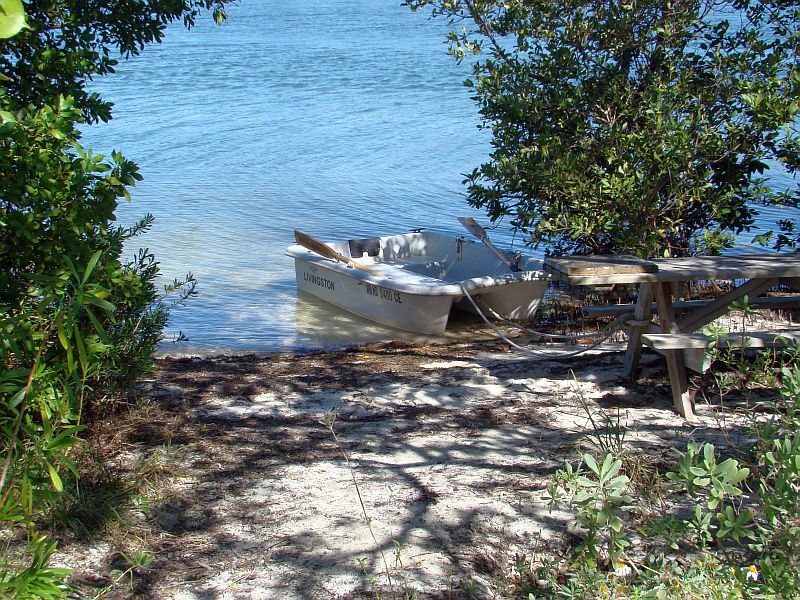 Once the dinghy was in the water we decided to forgo the outboard so we wouldn't disturb the peaceful atmosphere. Besides, we can always use the exercise, and the rowing ability of the Livingston dinghy is why we bought it. 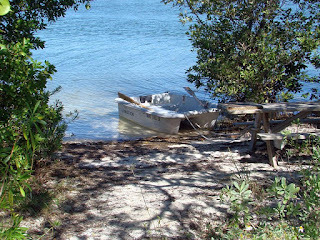 We found a nice spot right near the anchorage entrance to tie the dinghy up to a picnic table at the State Park. We wanted to walk around and explore the park and the facilities. There are a number of picnic tables under cover, restrooms, soft drink machines, a playground and a campsite for RVs and travel trailers. The entire park is very clean and well maintained. There is also a small but very nice beach that faces Hawks Channel. 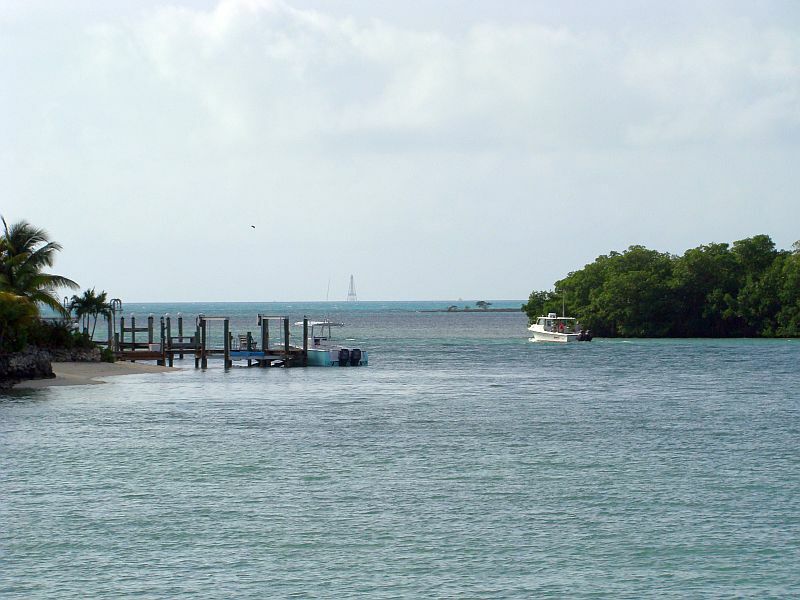 Believe it or not, beaches are fairly rare in the Florida Keys. The weather couldn't have been more perfect - light winds, comfortable temperatures and bright sunny skies. We walked through the campground and the facility for campers has restrooms and showers. The campsites are almost right on the beach, just a short walk, and all have concrete pads for parking. We found a couple of campers enjoying a good book in a chair on the beach. By midday, several families were enjoying the cool waters, not summer temps. After we finished at the State Park, we rowed through one of the canals off the basin. 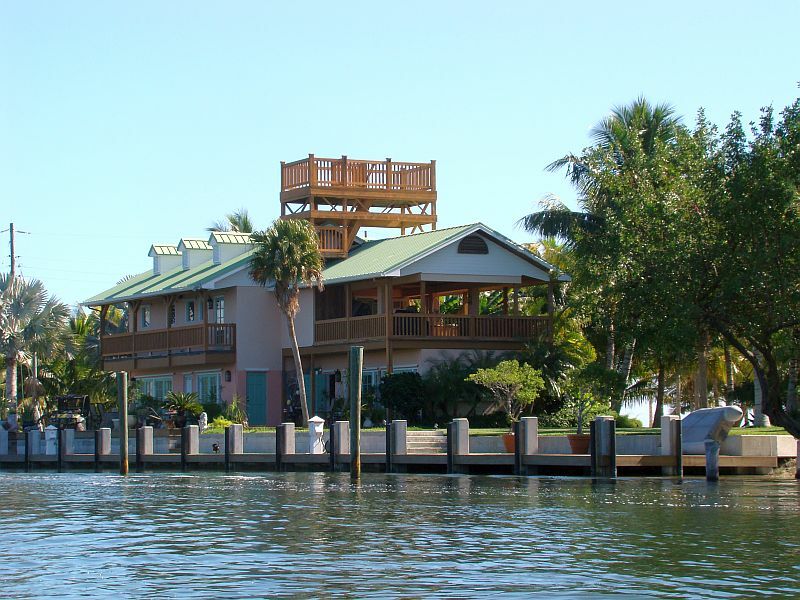 A very large home and dock sits on one side of the canal and the resort sits on the other. We saw only 2 people at the resort. The private home had landscapers working all day. A few small boats, kayaks and jet skis visited during the day, but for the most part, we had the anchorage to ourselves. The afternoon was spent reading, napping and relaxing. 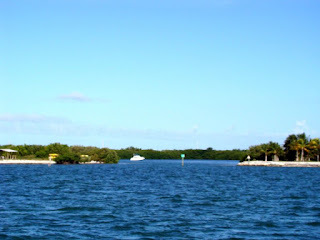 We really enjoyed being away from Boot Key Harbor and all of the constant activity. This is what we came to the Keys to enjoy and we vowed to do more of. There was one moment when we thought we were transported back to prehistoric times. 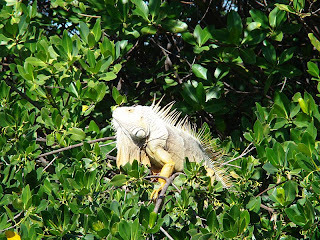 This large fella was hanging off a mangrove in the canal as we rowed by. We were lucky that he didn't decide to drop into the dinghy. The non-native Iguanas have become a serious problem throughout the Keys over the years. They started as pets that were released or escaped from their owners and now they are everywhere. This is one of the biggest and ugliest we have encountered yet. He certainly was pretty scary. We haven't decided whether we will stay an extra day or move on tomorrow. The weather will help us decide. We have a presentation on cruising at the City Marina on Tuesday and we will need to get to a dock sometime in the next few days since our water tanks will need filling. That means a return to Boot Key but we are already planning our future cruising after next week. The boat will need a good washing to get all of the salt water off and there is always laundry that needs to be done. Decisions, decisions.